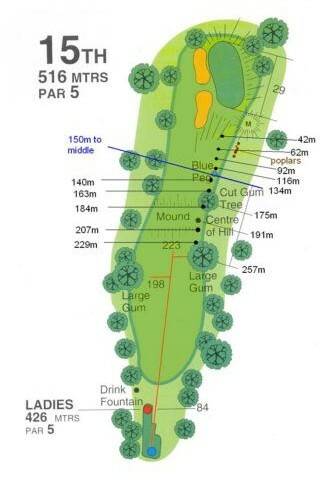 The last of the Par 5’s for the nine, the 516m 15th is a dogleg to the right, which requires a well stuck shot down the left hand side of the fairway. Any shot right of centre you find yourself blocked by the stand of tall gum trees on the corner of the dogleg. If you navigate the tee shot and second shot the approach to the green is relatively straight forward.